An ugly mass of buildings, pipes and vents sprawled beside the Caspian Sea appears an unlikely beginning for Europe’s future energy supply. Yet the Sangachal terminal in Azerbaijan is designed to become the opening link in a new chain that will connect the European Union to another source of natural gas, reducing the continent’s dependence on Russia. Beneath the Caspian’s waters, about 60 miles from the barren plain around Sangachal, lies the Shah Deniz field with 1,000bn cubic metres of gas. By 2017, this field’s second phase of development will have trebled Azerbaijan’s annual gas production to 24bn cu m, creating the opportunity to supply Europe. José Manuel Barroso, European Commission president, claimed to have seized that opportunity in January when he visited the country’s capital Baku and signed a “breakthrough” agreement to import Azerbaijan’s gas. While Azerbaijan might provide a convenient counterweight to Russia, the former Soviet republic is far from a model of stability. The authoritarian regime of Ilham Aliyev, president, has suppressed popular protests inspired by events in the Middle East. But the demonstrations do not threaten Mr Aliyev’s grip on power, nor his ambitions to turn his country into an important gas exporter. Everything rests on the construction of a pipeline to unite Azerbaijan’s gas with Europe’s customers. Three consortiums are vying to build this link and the final highly charged decision is set to come this year. If so, this will help to remedy one of Europe’s strategic vulnerabilities. The EU’s 27 member states import some 60 per cent of their gas, with Russia the most important supplier, providing the EU with about a quarter of its needs. But this conceals wide variations in the dependence of individual countries. Finland, Estonia, Latvia and Lithuania rely on Russia for 100 per cent of their consumption, while four more EU members depend on Moscow for at least 70 per cent. Their potential vulnerability was driven home in 2009 when a dispute between Russia and Ukraine briefly cut off supplies. Once Shah Deniz’s expansion is complete, however, Azerbaijan will have 10bn cu m of gas to sell to Europe every year. BP, the British oil group, is the operator in a seven-member consortium aiming to invest some $20bn in “Shah Deniz 2”. Choosing the right pipeline will be the first crucial hurdle. The tension between politics and economics, inevitable in large energy projects, will be more acute than usual. The most ambitious contender is the Nabucco pipeline proposal, which the European Commission sees as the best option for connecting the continent to the energy reserves of the entire Caspian basin, embracing not only Azerbaijan but gas-rich neighbours, particularly Turkmenistan. 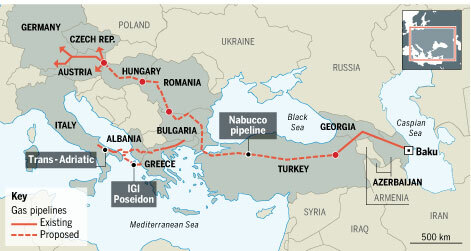 Nabucco aims to build a pipeline running 2,400 miles, from Turkey to Austria along a route that would offer an alternative supply to those countries with the greatest dependence on Russia. Nabucco may have European political backing, but its plan is by far the costliest: the consortium’s public estimate is €7.9bn ($11bn) of capital expenditure. Its internal assessment, however, has since risen to $16bn, according to a person familiar with the situation, although a spokesman described this as “speculation”. An outside calculation of the pipeline’s cost is $20bn. Nabucco’s annual capacity would be 31bn cu m  more than three times the amount of gas on offer from Azerbaijan. This reflects the ambition of the original plan, which involved bringing Iran’s gas reserves to Europe. Now that Iran is off limits, Nabucco is trying to “reinvent itself to bring gas from other sources in the Caspian or the wider Middle East region,” said Rodolphe Olard, managing director for natural resources at ING Bank. Nabucco would need about 20bn cu m of gas  twice the amount available from Azerbaijan  to allow it to offer a competitive tariff, said Riccardo Puliti, head of energy at the European Bank for Reconstruction and Development. But only two other countries could supply that extra gas  Turkmenistan and northern Iraq  and both raise a host of difficulties. Iraq’s central government would have to agree before the northern Kurdish region could export gas, and this permission is unlikely to be granted soon. As for Turkmenistan, another pipeline would have to be constructed beneath the Caspian to reach its gasfields. Russia and Iran insist they would have to agree first. Senior figures in the Shah Deniz consortium, who are concerned about getting the best tariff offer for sending their gas to Europe, are wary of a scheme that would rely on supplies coming from “nowhere”. Asked whether Nabucco would consider reducing its capacity, with possibility of scaling up in the future, a spokesman said this option had not been discussed and would have to be “decided by the shareholders”. The other contenders are cheaper and simpler, but their routes are less favourable: they end in Italy, rather than the European gas hub in Austria. The Trans-Adriatic Pipeline would mainly use existing infrastructure in Turkey and Greece and construct an 84-mile undersea link from Albania to Italy for €1.5bn. IGI Poseidon would follow a similar route, ending with a longer sub-sea link for €1.3bn. Both would have about one third of Nabucco’s capacity, geared to Azerbaijan’s exports. The Shah Deniz consortium has asked the rival pipelines to produce formal tariff offers by October 1. The partners will take the final decision, but Azerbaijan’s government will have the dominant say.